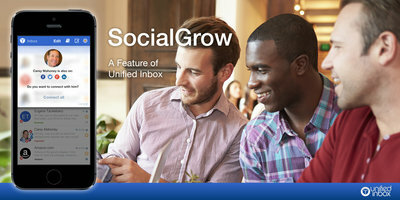 Unified Inbox, the social communication and collaboration platform, today announced that it has acquired Boston-based social networking application company SocialGrow for an undisclosed amount. SocialGrow’s Chief Marketing Officer and Co-Founder Ken Herron will join Unified Inbox as Head of Marketing. Key components of SocialGrow, an application that makes it easier for organizations and individuals to better connect with the people they know on different social networks, will be integrated into Unified Inbox’s product offerings. “SocialGrow gives us the opportunity to further unify your communications, including collecting and managing contacts from your in- and outboxes. Integrating SocialGrow showcases how we are using unified communications as a platform to encourage developers to create apps that will allow customers to fully customize their inboxes &mdash pixel by pixel if they so choose &mdash to meet their specific needs and preferences,” said Unified Inbox CEO Toby Ruckert. With experience holding several executive marketing and sales leadership positions and an expertise in rapidly growing revenues for multiple early- and mid-stage startup companies, Herron will spearhead Unified Inbox’s global marketing efforts as the company readies its first commercial launches and prepares for global availability in 2015. 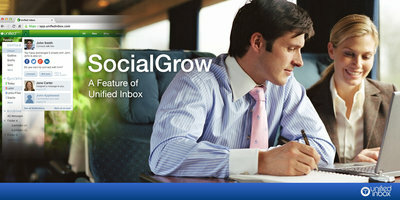 SocialGrow will enable businesses and organizations to easily connect with prospects and customers across various social and professional business networks, which supports Unified Inbox’s focus on enhancing how people communicate on their different email, messaging, and social media communications channels, and introducing a new communications protocol. The acquisition of SocialGrow comes after other recent milestones of Unified Inbox with its July 2014 announcement of leveraging SAP HANA© technology for its smart sorting mechanism “InboxRank©”, its May 2014 acquisition of U.S. firm SMAK to integrate LifeModes®, and the April 2014 opening of its new global headquarters in Singapore.